Jeff Riggenbach reads Professor Block's Defending the Undefendable! "Defending the Undefendable performs the service of highlighting, the fullest and starkest terms, the essential nature of the productive services performed by all people in the free market. By taking the most extreme examples and showing how the Smithian principles work even in these cases, the book does far more to demonstrate the workability and morality of the free market than a dozen sober tomes on more respectable industries and activities. By testing and proving the extreme cases, he all the more illustrates and vindicates the theory." F.A. Hayek agreed, writing the author as follows: "Looking through Defending the Undefendable made me feel that I was once more exposed to the shock therapy by which, more than fifty years ago, the late Ludwig von Mises converted me to a consistent free market position. … Some may find it too strong a medicine, but it will still do them good even if they hate it. A real understanding of economics demands that one disabuses oneself of many dear prejudices and illusions. Popular fallacies in economics frequently express themselves in unfounded prejudices against other occupations, and showing the falsity of these stereotypes you are doing a real service, although you will not make yourself more popular with the majority." "Looking through 'Defending the Undefendable' made me feel that I was once more exposed to the shock therapy by which, more than 50 years ago, the late Ludwig von Mises converted me to a consistent free market position. Even now I am occasionally at first incredulous and feel that "this is going too far," but usually find in the end that Block is right. Some may find it too strong a medicine, but it wills till do them good even if they hate it. A real understanding of economics demands that one disabuses oneself of many dear prejudices and illusions. Popular fallacies in economics frequently express themselves in unfounded prejudices against other occupations, and in showing the falsitty of these stereotypes Block is doing a real servic, although he will not make himself more popular with the majority." "Judging from the outraged responses in many libertarian quarters, many of 'our people' are not ready for this exciting and shocking adventure. Since libertarians are, or are supposed to be on the forefront of thought, since their whole lives have been an intellectual adventure in many ways, the hostility becomes even more mysterious." "There are things that I strongly agree with and things that I strongly disagree with, but the book thoughout is amusingly and sharply reasoned, couragous and always provocative." "Many years ago Hazlitt's little masterpiece, Economics in One Lesson, demonstrated how, in order to measure the consequences of economic activies, one must look beyond their immediately obvious effects to thir secondary effects. Here Professor Block sets out highly specific, and sometimes shocking examples of Hazlitt's thesis. By concentrating on the positive economic contributions of extreme cases, he forces the reader's consideration and greater appreciation of these principles." "It is a magnificent book, a trailblazer. I would call it ;Drano for Clogged Minds,' except that Drano is neither amusing nor stimulating, and this book is both. I suggest buying two copies: one for yourself and one for the person you want most to catch up with you." "...More than almost any current book, DTU will wake the reader from his dogmatic slumbers. It is eminently readable, challenging, and provocative." "Startling and illuminating! Block's lucid defenses often convince: sometimes they lead us to sharpen our attack. In either case, the reader cannot fail to be instructed and challenged by this mind-stretching, provocative, and occasionally infuriating book." "What the critics have missed is that a book of libertarianism, not Objectivism, not Christianity, DTU used the most effective method for illustrating and teaching moral principles. Shock your friends and educate them." "This witty and wonderful book is a veritable manual of the 'joy of freedom.' IUf we were only half as interested in liberty as in lust, we would not have half the problems we have." "The most entertaining and one of the most instructive economics books I've ever read. Block's unique style helps you see what's going on around you quickly and clearly. The book is terrific. Taking the most extreme examples possible and clarifying them will do more to bend the reader's economic thinking than a slow steady course in good economics." "We can congratulate Dr. Block for some iconoclastic and courageous interpretations." "After reading Block's book, we recognize the pimp as an honest broker and the uncorrupted cop as the Nuremberg defendant who always followed orders. We are reminded that strip mining of coal allows miners to escape black-lung disease and cave-ins... Block gives the reader succinct yet penetrating criticisms of the Federal Reserve System, and the Keynesian paradox of savings. His chapter on charity is the best modern defense of social Darwinism that I have ever read." "It is a brilliant, relentlessly argued book, pushing the libertarian case to its extreme limits...take seriously Ayn Rand;s dictum that one should be willing to defend the least attractive instance of a principle, and has done precisely that." "Shatters, one by one, each of our liberal steroetypes. It's a pleasure to read and a treasure trove of ammunition for the defender of the free market." "toleration of unpopular religious and cultural groups has always been one of the chief tenets of classical liberalism...Block carries this libertarian principle to its logical and radical conclusion: toleration of all non-aggressive pursuits." "A remarkable book. I found myself agreeing with Block for most of the time, and his argument is often ingenious. Spend a pleasant evening reading aloud some of his chapters (they are really quite short)." "There can be no question of my writing a testimonial on behalf of this book." 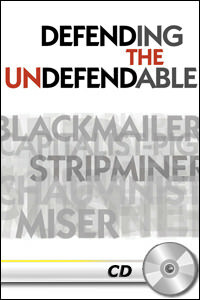 "Defending the Undefendable-A doomed attempt, one would say. Like thinking the unthinable, uttering the unutterable, or calculating the incalculable. As the philosopher remarked, wherefor one cannot speak, thereabout one had better keep quiet. Rather non persuasive are the cases made out for the Dishonest Cop, the Speculator in food, the Non-Contributor to Charity, the Stripminer, the Drug Pusher, the Denier of Academic Freedom, and the Person who yells 'fire' in a crowded theatre. A passion for justice ought to inspire one to greater efforts." "...A positive menace to the libertarian movement. His smart-alecky, sensationalist style, the silly and false social and psychological assumptions he uses to back up some otherwise (mostly) valid political and economic points, the frivolous and insensitive attitudes he displays toward serious human problems all serve to confuse and distract from the valid points. Most people will be difficult to convince on rational political grounds without obscuring the issue with other half-baked, offensive, and unnecessary arguments. The book will be offensive to people not just because his general attitude will be interpreted as callous, asinine, and an affront to human dignity. It will surely reinforce the worst stereotypes people have about capitalists." "..The wrong book at the wrong time...An absolutely mad way of introducing someone to libertarianism...I am convinced that it is probably a short run strategic disaster. One needs not only a steel will based on solid libertarian premises to accept Professor Block's message, but one needs a cast iron stomach as well. Those whom he defends are often, if not usually, the dregs of society: we could even say the very scum of the earth." "DTU is a work of unrealized potential. The editing is sloppy. And the quality of the writing varies from chapter to chapter. Many good arguments, and indeed the book itself, founder over a simple misconception: Block is misusing the word her...He is not consistently attentive to detail, nor is he very ambitious in enriching his rich thesis with examples and anecdotes. If he had attended better to the art of writing and spared us the silly insistence of making all of society's rogues into heroes, thes his very important thesis might well have become a very important book." "Not only does he defend prostitutes, pimps, counterfeiters, ticket scalpers, slumlords, blackmailers, libelors, stripminers, letterers, and scabs (among others), he actually has the temerity to call them heroes! Block even has the gall to challenge the most enduring shiboleth of higher education, academic freedom." "The polarization of opinions on Block's book should not be surprising. It is reflection of the book's schizophrenic nature-a bizarre combination of both excellent and horrible elements. Apparently the endorsers chose to consider only the Dr. Jeckyll side of DTU and either ignored or failed to take seriously Mr. Hyde." "Political and economic defense of the voluntary activities of society's 'scapegoats' -pimps, slumlords, moneylenders, etc. Done in a sensationalistic style, much of the reasoning is questionable and unnecessarily offensive. Not a good introduction to libertarianism." "Block defends some of the silliest ideas in support of an essentially good cause...He raises some stimulating issues, even if in an intellectually inadequate fashion...A foolish consistency may be the 'hobgoblin og little minds,' as Emerson said, but serious inconsistancy (as in this book) is the downfall of many theories about morality and law." The author does an excellent job defending the rights of those who the state and society deem bad. I would read this book no matter what your views are on the topics. This should be on everyones to read list. I haven't heard the CD, but I have read the book. This work goes past the coddling and begging and reaches an entirely new level of red meat libertarianism. The topics are shocking, but its defense of this rogues gallery of characters "everybody knows" are bad, dangerous, harmful, etc. is calm, well-reasoned, and nearly impossible to argue against. Most por-liberty stances deal with the morality choice, and are simplified to the non-aggression axiom. Professor Block goes much deeper, and turns around the popular arguments that these "criminals" harm society, and walks the reader/listener through the true reality, illuminating not only the gross immorality of dictating personal behavior and destroying choice, but also the startling benefits these oft-maligned personalities gift society. This book (now recording) belongs in the starter kit of anyone wishing to spread the gospel of liberty alongside "Ain't Nobody's Business if You Do," and Paine's "The Rights of Man."